He actually really needed help. 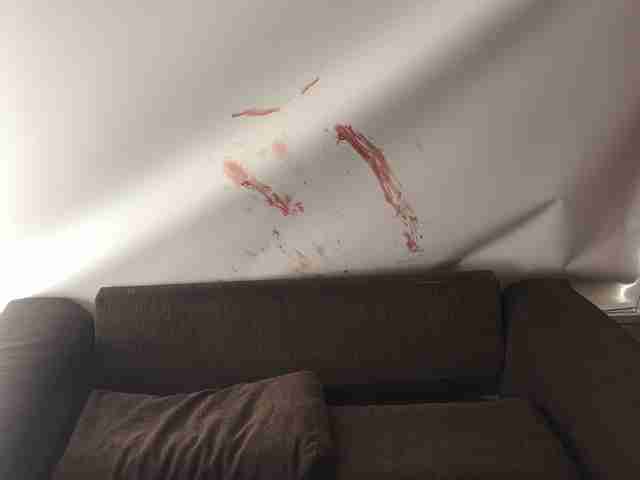 Blood smeared across the walls of the living room is something that no one wants to see — but that's exactly what a family in Victoria, Australia, saw after hearing a loud crash that woke them up earlier this week. And there was a trail of red across the floor. A window was shattered, too — there was obviously an intruder. Mafi Ahokavo, who was woken up along with his partner and young son, went to investigate and began to piece together what had happened. The large kangaroo standing inside his house then provided an immediate explanation. “I haven’t even seen a kangaroo in my life,” Ahokavo told local news. The kangaroo was, understandably, just as freaked out as Ahokavo. And the blood splattered around was actually the animal's own, from some scratches he got when he hurled himself through the window. 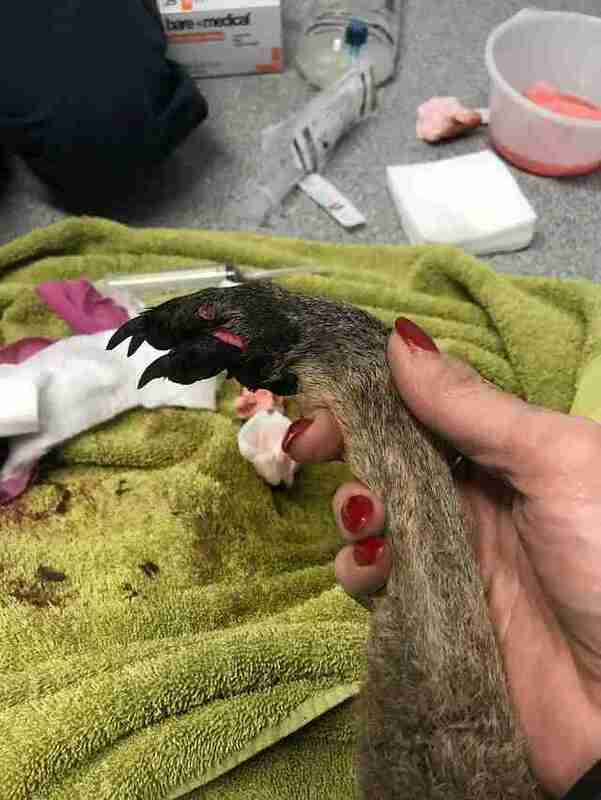 At a loss, Ahokavo contacted the police, who then contacted Five Freedoms Animal Rescue, a local organization run by Manfred and Helen Zabinskas. They rushed over to help. 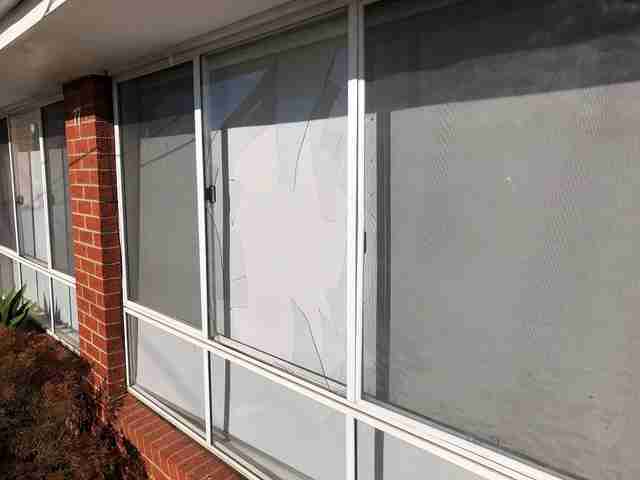 "In a panic, he [had] hopped around the house and smashed the lounge-room window in his attempt to escape," Manfred wrote on Facebook. "With numerous lacerations from the broken glass, he left each room looking like a scene from 'Psycho.' 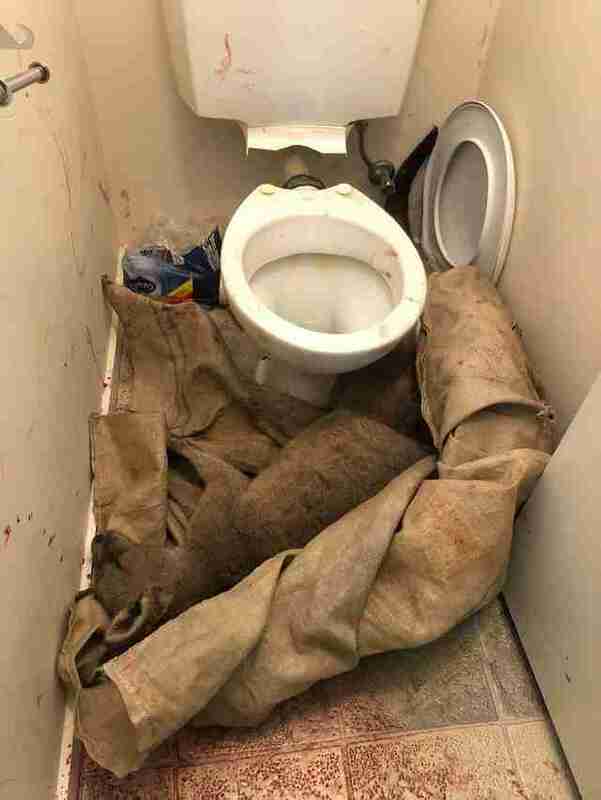 Eventually, he became exhausted and collapsed at the base of the toilet where the occupants were able to shut the door and lock him in." Given the chilling scene the kangaroo had left, Manfred and Helen decided to call the kangaroo Norman, after Norman Bates, the lead character in the classic horror flick and novel "Psycho," and brought him to Essendon Fields Animal Hospital, where he could get stitched up. "His wounds are not all that bad considering what he went through," Manfred wrote. 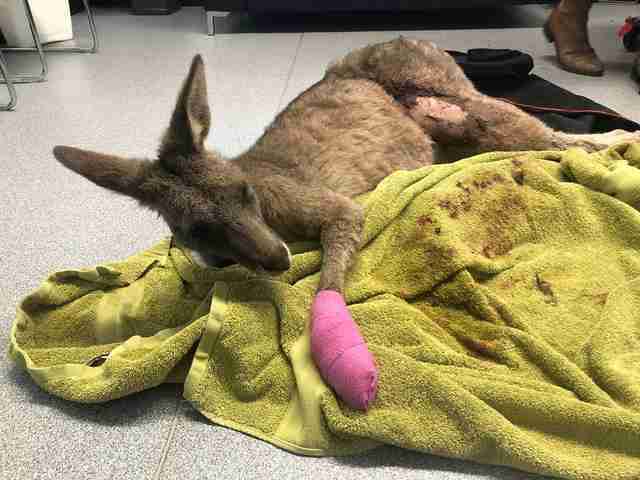 "He had obviously hopped a considerable distance on roads ... Kangaroos are increasingly caught up in suburban areas as we continue to build new shopping centers, industrial zones and housing estates into the ever-diminishing areas that are traditionally home to kangaroo mobs. Poor Norman was not all that far from open fields but took a wrong turn into a court and couldn’t find his way home." Sadly, kangaroos often suffer from run-ins with people, as housing and commercial developments expand into their habitats, and Helen said that for years the government has failed to implement a plan that would help these animals. "Successive state governments have failed to plan and make provision for native wildlife. Their default setting is to invade and either kill kangaroos for development or let them be wiped out by the loss of habitat or by cars and misadventure," she told The Dodo, adding that in some places, kangaroos are even killed to make room for sprawl — and it's totally legal. So that's one reason that Helen and Manfred are so devoted to saving individuals like Norman. Even his little paws had lacerations from his far wanderings to find his home again, so he was bandaged in a bright pink cast. Manfred and Helen brought Norman back to their rescue center and gave him a blanket and his own room where he could rest and recover from his scary journey. 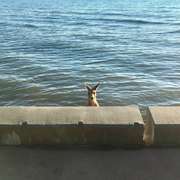 Psychotic or not, Norman the 'roo proved himself to be quite antisocial and deeply wild indeed. 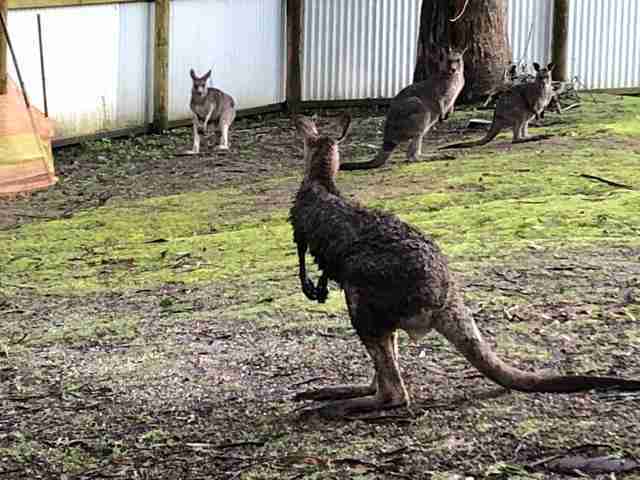 He was up and alert in just 24 hours — and when he was allowed into the enclosure containing other, calmer kangaroos being rehabilitated for their release, he seemed aghast. "The saga of Norman Bates the kangaroo took another turn this morning!" Helen wrote on Facebook after she witnessed something truly startling. "Norman was having a great deal of trouble coming to terms with captivity and, while he had some of our other kangaroos for company and all of our hospitality provided, he wasn’t happy," she wrote. 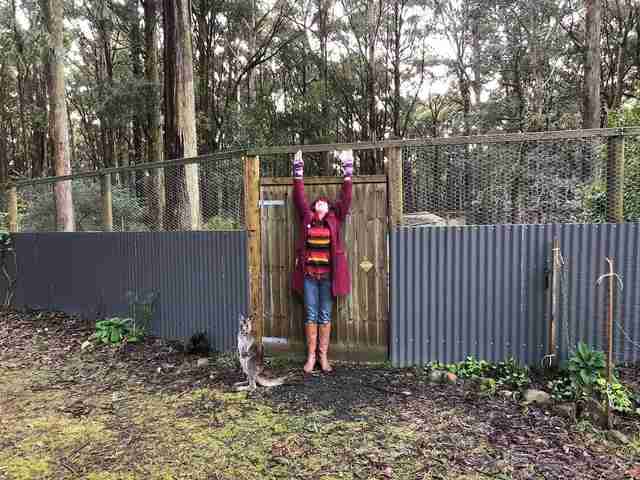 "In fact, he was so distressed by his continued ordeal that after Manfred left for work and when I was delivering breakfast to the enclosure this morning, Norman leapt over our 2.2 meter-high [about 7 feet] gate at the top of our enclosure, the first kangaroo to do so since we built the facility a few years ago." Thankfully, Helen and Manfred believe that Norman will be fine in the wild, even though they would have liked to keep the guy around for observation a bit longer. "Norman is probably better off because he was not coping with captivity despite a large enclosure and other kangaroos for company," Helen told The Dodo. "Amazingly, Norman’s injuries were only superficial and in places where he can lick to keep clean, [and] there are lots of kangaroos living in the forest and plenty of native grasses for him to feed upon. So, we think his chances are pretty good." 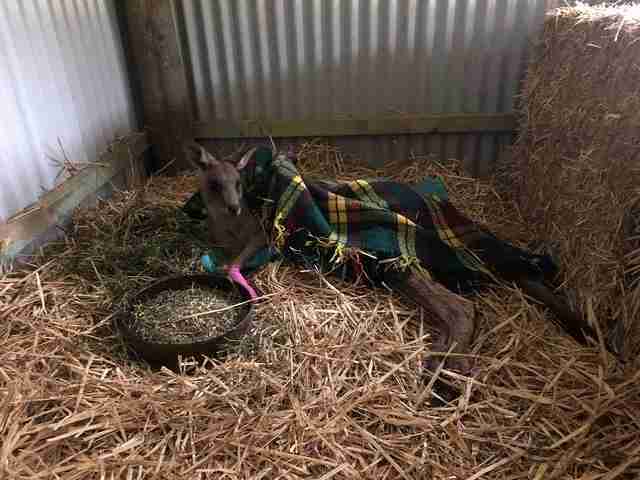 You can help wild kangaroos get back on their feet by donating to Five Freedoms Animal Rescue.